Fine, but can you be specific? well, GLOBALISTS are kind of like illuminati, wealthy string-pullers hiding behind the curtain of corrupt governments and corporations. I can't name names, but I can see their shadows: the EU, the US deep state, the moslem brotherhood, the communist party. I always though the BC issue was meant to mess with us while Obama implemented his policies. I am not even convinced that his father is B.O. sr, rather than Frank Marshall Davis. Who really knows, and who will ever know? Better to spend our time educating the wider public on the Constitution and limited govt, and keeping children out of government schools. Try starting with Sores and Bush and go one from there. Other than obvious forged long form, short form, and selective service forms, and the pre-owned like new social security card, there is no evidence he was ever a citizen of the USA. Forget natural born. No evidence he was ever a citizen. Probably born in an unwed mothers home in Vancouver, Canada, to a teen too young to confer her citizenship upon him, meant to be given up for adoption, but she took him at the last minute. As a US Senator he was handed a ceremonial passport. First USA pass he ever had. Based on zero documentation, and one guy died in the passport office break in to obfuscate his lack of documentation. I downloaded the same file. What was especially interesting is when it was opened in Illustrator and inspected the properties of the separate objects, each had a different resolution and sometimes different color format. Had the document been scanned, and some magical Bermuda Triangle voodoo had happened, each of the embedded objects would have had exactly the same resolution and color properties as all other objects and parts. It was clearly pieced together and saved as a pdf rather than scanned. right, pappy boosche nearly coined new world order. At the time, I also downloaded the PDF file of what the WH was calling a copy of Obama's long form birth certificate from the WH website. I was able to quickly identify at least 12 different layers of a Photoshop-created file that were not "flattened" before saving it as PDF file. The document that the WH claimed was a photocopy of the one page original long-form birth certificate, was, in fact, a complete fabrication and forgery. It contained multiple layers stacked on top of each other to make up the birth certificate. This could never be done with a copy of the original document if it was real. If the creator of the file had "flattened" all of the layers before saving it, it might have passed scrutiny. But the creator either forgot to do this, didn't know enough about Photoshop to do this or just plain old failed to flatten the layers before saving the final file as a PDF so that everyone in the world who possessed even the smallest knowledge of digital graphics, could tell it was a computer created file. So fake, that if you or I had submitted such a document to prove our date and place of birth, we would be in jail for forgery long ago. What Donald Trump claimed about Obama's long-term birth certificate being a fake, was true. ".... Could we do this on a lesser level with minor agencies and come home scott free?..." Absolutely not. 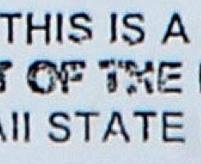 If you or I had submitted this file to the government as proof of our birth, we would be in jail for forgery long ago. The fact that no one paid the price for generating this hoax on the American public in the full light of day, is what first woke me up to the fact that the government was not to be trusted and what they claim is not true. This was an inside job and the democRATS knew Obama was not eligible to be president but kept the facts hidden to get into power. It also highlights why Obama spent millions of dollars to keep records of his past under lock and key, hidden from the view of the public. A reasonable man, a common use in legal trials, would assume he had something to hide. Or else why would he go to such lengths to keep his records hidden from view? Because he did have something to hide, that's why. Hellary will be in prison long before the real BC comes out and everyone knows she’ll never ever come anywhere close to prison. He was born in KENYA. The “footprint” birth certificate proves it. Make no mistake - I would LOVE to see this cracked wide open. But this reminds me of my attempts to make something “perfect”, as I used to be CDO (OCD in alphabetical order, like it should be). I sooooooo wish my project to be perfect, but my skill at whatever I’m doing is not up to the level needed to make it so. Eventually, I have to say “Oh crap, that’s good enough”, and let it go. Do you understand how hard that is for an OCD person to do that? Monumental. I AM SOOO HAPPY that this has resurfaced, but I can’t really deal with it any more. I’ve relegated it to the category of waiting until Jesus comes back to have it set right. God Bless anyone who can make this happen, but I just have to root for DJT (he’s NOT Jesus...) and pray he can negate everything the Kenyan did. Likely some of the very same people that congregate in Davos & Aspen biannually. And some of the same that met on St. Sinon’s or Jekyl Island tp block PDJT just after he won the delegates and Cruz was forced to concede. Make no doubt about it, they were conspiring to block his nomination by hook or crook. They are unable to manipulate him and he has security on his family. He is the first and may be the only challenge the globalist cabal has ever known. May Good Bless President Trump and keep him safe. This was put on the board several days ago and I am pinging my Arpaio ping list, for the record, in case anyone missed it. It is a doubtless doomed attempt by Sharon Rondeau of Post & Email to get new Democratic Chairman of the House Oversight Committee to investigate Barry’s forged BC. Well it’s certainly a fake, but it’s hard to imagine that the House Oversight Committee will admit the possibility. "0bama submitted two frauds to the American public. First it was a phony Certificate of Live Birth and then the Birth Certificate. Also phony as a three dollar bill." 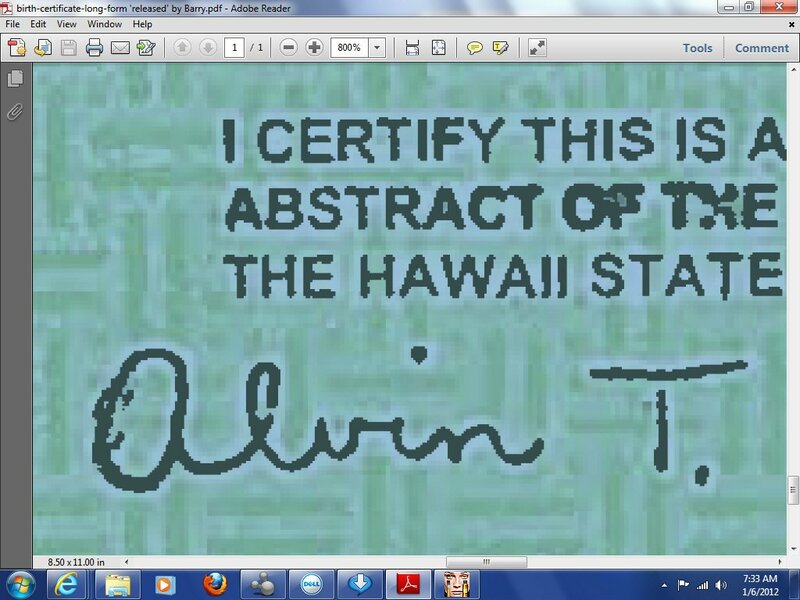 Yabut, aren't all "official" government docs created with smiley faces that certify the "Absract Of TXE Record"?